Saving the Pakistani soldiers from the resentment of the Bangladeshis, who endured the most horrific genocide of that time,2 became a major challenge once Pakistan's defeat was imminent. Though it was argued that "given a few more months the Bangladesh guerrillas might well have won on their own,"3 India's direct involvement not only reduced Bangladesh's sufferings, but also came as a saviour for the failing Pakistanis. India being a signatory of the Geneva Convention had an obligation to treat the Pakistani POWs lawfully. On December 24, 1971, Bangladesh's Home Minister A.H.M. Kamaruzzaman announced that Bengali authorities had already arrested 30 top Pakistani civilian officials and would soon put them on trial for genocide. The leader of the liberation movement Sheikh Mujibur Rahman -- soon after his return from captivity -- initiated a formal process of war crimes trial. On June 19, 1972 -- ten days before the meeting between Zulfikar Ali Bhutto and Indira Gandhi -- Sheikh Mujibur Rahman reaffirmed his commitment to try the Pakistanis. Bhutto knew how critical it was for the war-torn Bangladesh to get the membership of United Nations and he used his friendship with China over this. When Bangladesh applied to the United Nations, China cast its veto on August 25, 1972 for the first time in the Security Council to bar Bangladesh's membership.19 Bangladesh was refused United Nations membership for wanting to try the war criminals. Bhutto kept on insisting that Pakistan would only recognise Bangladesh after its prisoners were released. In November 1972, Bangladesh and India decided to repatriate some 6,000 family members of Pakistani POWs and, in response, Pakistan agreed to release some 10,000 Bangladeshi women and children held in Pakistan.20 However, the fate of most Bangladeshis trapped in Pakistan remained uncertain. Bangladesh, however, made it clear that India would not release 195 of the initially accused Pakistani POWs and Bangladesh would try them, along with its local collaborators, for war crimes. Meanwhile, on August 28, 1973, India and Pakistan signed the Delhi Accord, which followed the Bangladesh-India "simultaneous repatriation" proposal. This allowed the release of most of the stranded Bangalis and Pakistanis held in Pakistan and India respectively for almost two years. 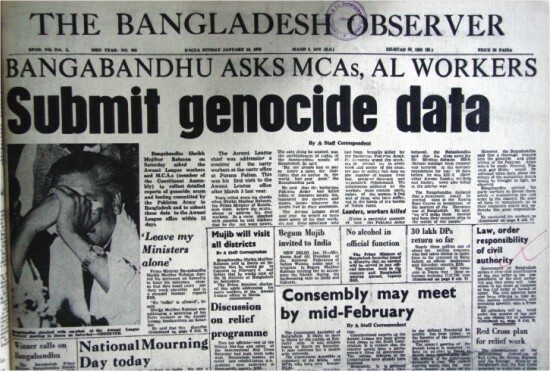 The tripartite repatriation began on September 18, 1973 and some 1,468 Bangalis and 1,308 Pakistanis were repatriated within the first week.26 Pakistan and India agreed that the issue of 195 accused Pakistanis would be settled between Bangladesh and Pakistan.27 Pakistan kept the 203 Bangladeshis out of this repatriation process. Though a tripartite diplomatic impasse clouded the trial of the Pakistani POWs, the Bangladesh Collaborators (Special Tribunals) Order 1972 was announced to try the local war criminals. Bangladesh also continued to amend its legal system in preparation for the trials of both Pakistanis and local collaborators. Interestingly, though the trials of the collaborators were abandoned, Article 47(3) and the International Crimes (Tribunals) Act, 1973 -- which offers the trial of war criminals including the "auxiliary" forces for their crimes against humanity -- were not cancelled by any government and are still applicable. After about one year, Bangladesh finally accepted Pakistan's proposal, fearing for the fate of 400,000 Bangalis trapped in Pakistan and to gain the much-needed access to the United Nations. With faith that Pakistan would hold the trial of the 195 Pakistanis involved in the wartime atrocities, Bangladesh withdrew its demand for trying the Pakistanis in Dhaka. Upon the formal understanding, the last group of 206 detained Bangladeshis was allowed to return home on March 24, 1974.31 It is clear that the 195 Pakistanis were not freed without charges, rather they were handed over to Pakistan so they could be prosecuted by the Pakistani authorities. Article 14 of the tripartite agreement noted that the prime minister of Pakistan would visit Bangladesh in response to the invitation of the prime minister of Bangladesh and "appealed to the people of Bangladesh to forgive and forget the mistakes of the past in order to promote reconciliation." 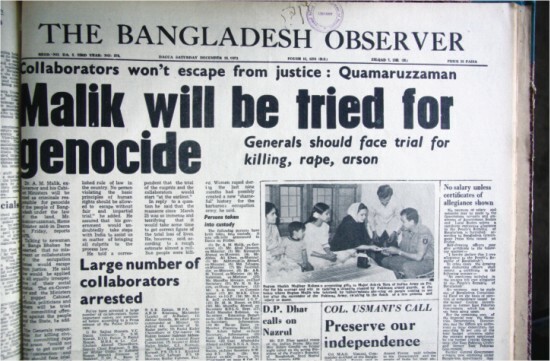 At that time, Bangladesh continued the trial of local collaborators and hoped that Pakistan would keep its promise and try those soldiers for the horrific crimes they committed against humanity. 29	The International Crimes (Tribunals) Act, 1973 (ACT NO. XIX OF 1973). 20th July , 1973. Government of Bangladesh. 32	Pakistan Offers Apology to Bangladesh, The New York Times, Apr 11, 1974; pg 3. Sayeed Ahamed is an Australia-based public policy analyst and is a member of Drishtipat Writers Collective.